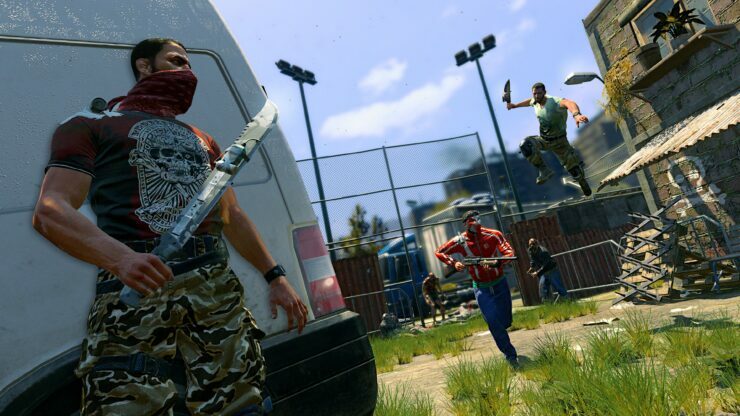 Dying Light, the parkour zombie game, is soon getting a standalone Battle Royale game. Although the fledging genre already has thousands of entries, Dying Light Bad Blood is hoping to stand out from the crowd with its mixture of PvE and PvP combat. Hosting a much smaller batch then the typical one hundred players (twelve survivors will join each match), Bad Blood isn’t much about killing all your opponents either. In each round, players will have to gather samples of zombie juice from varyingly protected hives. 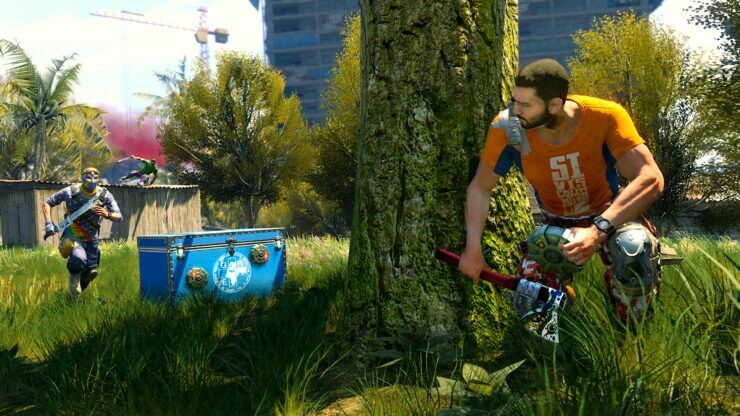 Of course, you’ll need to scavenge for weapons and protection like any other battle royale, but the zombie juice is ultimately more important. The more juice you gather, the higher level you’ll be, which increases your maximum health and lets you deal more damage, as you would guess. When you’ve collected enough of the juice, extraction is called. You’ll be told where the helicopter is picking you up from, and so will every other player. Once at the location, you’ll have to hold your ground and defend from any player looking to steal your ticket out of the zombie apocalypse. If it’s been a while since you last played Dying Light, you might have forgotten that among the typical zombie horde is the occasional Goliath-like monstrosity. These big boys are guarding the larger hoards of zombie juice and can be incredibly tricky to take down. As I discovered. Repeatedly. But what else I discovered did give me an edge. While these brutes might be protecting their gross, organic pillow thing, it’s not impossible to harvest what you need without killing them. If you happen to stumble across another player engaged in the epic fight of circling around the giant while slowly chopping his health down, you might think it’s exactly the best opportunity to strike at the player and remove the competition easily. Or you could just steal the juice and get out of there before anyone can stop you. All’s fair in love and war and zombies, and if that means stealing another player’s juice, then that’s what I’m going to do. Naturally, if you kill another player you can take everything they’ve collected, something I found out when the victim of my little escapade hunted me down and murdered me with a pistol. Dying Light Bad Blood offers an exciting twist on the already extremely familiar formula and the parkour makes the entire game feel more fluid and dynamic. 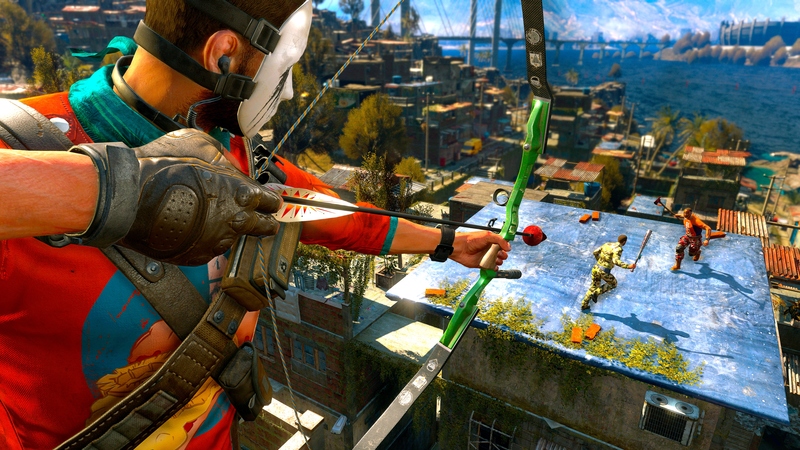 Leaping, sliding and climbing make the city much more accessible and at the same time, player ambushes all the more threatening. The map itself will be familiar to anyone that played the original game, as will the hefty melee combat. Dying Light 2 might be getting a lot of the attention with its impressive narrative consequences and expansive world, but I won’t count out Bad Blood just yet. Obviously, it’s probably not going to hit the lofty heights of Fortnite or Battlegrounds, but before I got to play Dying Light Bad Blood at this years Gamescom, I was shown a short presentation about the success of the base game. And while I won’t bore anyone with the numbers, I will say they have a vast and loyal fan base, even three years on. With its smaller, faster focus, tied in an extremely resilient brand, and the inclusion of zombies, I would be quite surprised if Bad Blood didn’t find a dedicated audience. More than that, the team working on Dying Light Bad Blood at Techland promised that “you can expect the same level of support post-launch for Bad Blood that you got for Dying Light”, which is pretty impressive given Techland’s dedicated support of the original game. The game is out next month on Steam Early Access. After the early access phase, the game will be free to play on PC, PlayStation 4 and Xbox One.